Our imagination is an incredible force—it can build bridges or pitch battles, birth wonders or carnage. Speaking negatively about others can be as powerful a craving as the craving for sweets or even an illicit drug. A little bit is tantalizing, but no matter how much one indulges in it, satisfaction is always just out of reach. No amount of shredding others’ reputations or dishing the dirt can satiate. Loshon hara, literally, “evil tongue”, is negative speech about another that is true, or at least appears to be true. * It usually isn’t true, though, or at least not the whole truth, since one person’s glimpse of another and subsequent tale-bearing is almost always always tainted by unpleasant personal feelings and biases—we don’t gossip about people we love or feel good about. Judaism says Loshon hara kills three people: the speaker, the listener, and the subject of the gossip. Not really. Think about it. Talking badly about another robs the speaker of her intellect—the same mouth that might inspire love and connection and utter great truths is now being used to manipulate another’s thoughts and teach her to hate. Gossip reduces the speaker to a slave of her animalistic imagination, panting with desire to damage. Even if she feels she has good reason to tell let’s say just one listener, won’t she embellish or exaggerate to get her point across? No matter what, her spiritual knowledge, even if very great, is lost. It robs the listener of her innocence and belief in the goodness of others. Even if she follows Jewish law and tries her best to not believe the story; even if she tries to give the subject the benefit of the doubt, next time she sees the gossipee, the listener will probably find it impossible to put that bit of dirt out of her mind. That rotten seed, once planted, can’t help but sprout. Gossip and slander also robs the subject of her good name and damages her relationships, whether or not she is aware of it. The speaker, the listener, and the Angels in Heaven now have heard negative pronouncements about this person. The Heavenly Courts listen to the judgments of our fellow men and women. Gossip and slander shatters relationships of all kinds. It fractures unity and togetherness. Gossip limits the ability to love. Rebbe Nachman of Breslov repeatedly tells us about the dangers of loshon hara, but his concern wasn’t limited to the divisiveness it causes. He was concerned also with how it destroys the gossiper’s ability to remember the overarching goal of life—to live a good and holy life in this world and the World to Come. What’s the treatment for the habit of speaking ill of others? Speaking openly to Hashem is a good first step. Hisbodedus or prayerful meditation, can open the doors to your true self, your loving and kind self. Saiyng to Hashem, “I want to change, I don’t want to have bad feelings and thoughts about others anymore,” with all your heart, may start meaningful transformation. Talking openly with Hashem and asking for help can also help us overcome other transgressions, even bad habits. Purim is like Yom Kippur (Yom Kippur is called Yom Hakippurim and k’Purim means “like Purim” in Hebrew). On Yom Kippur, we don’t eat, drink, or otherwise indulge in earthly, material things. On Purim, we eat, drink more than usual, and party. Yet, Purim is considered to be “higher” than Yom Kippur! Since on this day, we’re embracing the joyous holiday of Purim, drinking and eating, and partying with others, we’re feeling happy, even beneficent. Purim is a time when fences can easily be mended and unity can reign. V’nahafoch hu, an important theme of Purim, means “it was turned to the opposite”. Purim is the day that nothing is as it seems. It’s also the time where we discover secrets about reality, really deep ones. We are supposed to get to the point where we can’t tell Mordechai (the hero) from Haman (the villain). Dear Breslov Women, if you’ve gossiped about or slandered another person, or any other act that might have harmed someone, consider using this special day to heal the relationship. If someone has hurt you, consider truly forgiving them. One way to encourage friendship is to send Mishloach Manot (Purim Basket). If you have a relationship that could use some healing, whether or not you’ve spoken or heard loshon hara about the person, consider sending them a basket of delicacies. Today, there are very few people alive who have not, at some point, spoken a negative word about another. But each of us can belong to a more precious group—those who might have harmed but now heal. *Motzei Shem Ra, giving someone a bad name, lying about them, and destroying their reputation, can be translated as slander. **I highly recommend Sara Yehudit Schneider’s incredible book, You Are What You Hate. She’s a BreslovWoman group member on Facebook; if you want to be a member, friend me on facebook and tell me you want to join. 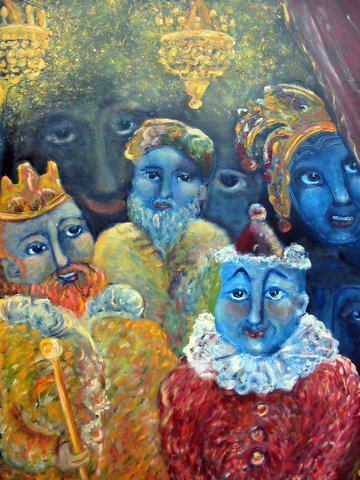 This wonderful painting is by artist Esther Zibell, a BreslovWoman group member on Facebook. If you have art or other works you’d like to be featured on BreslovWoman.org please contact me at chayarivka@breslovwoman.org. Note: There are proactive steps Torah wisdom recommends to help heal relationships. Speak to your halachic advisor.